Refugees In Texas Get Help With Medical Care From Students : Shots - Health News More refugees have settled in Texas than in any other state. In San Antonio, students at the University of Texas Health Science Center help them get long-deferred medical and dental care. 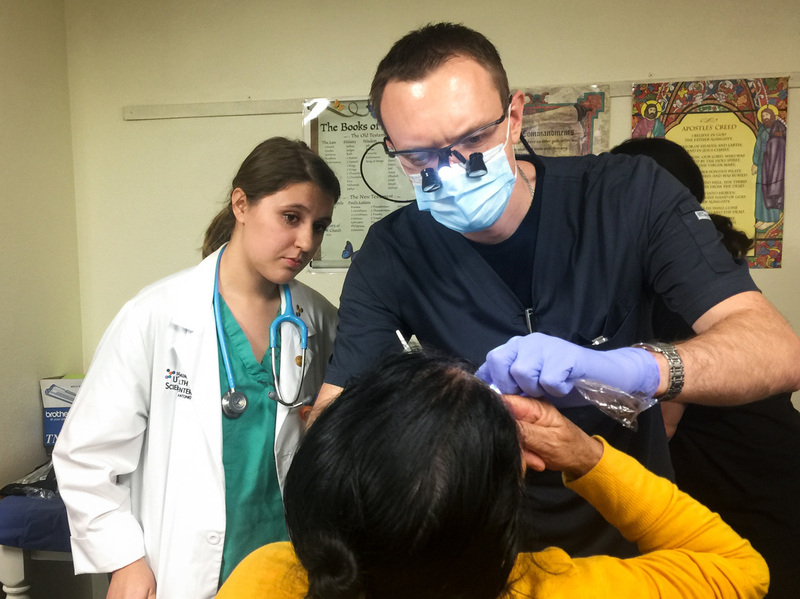 Third-year dental student Alex Dolbik checks the oral health of a patient at the Refugee Health Clinic in San Antonio. 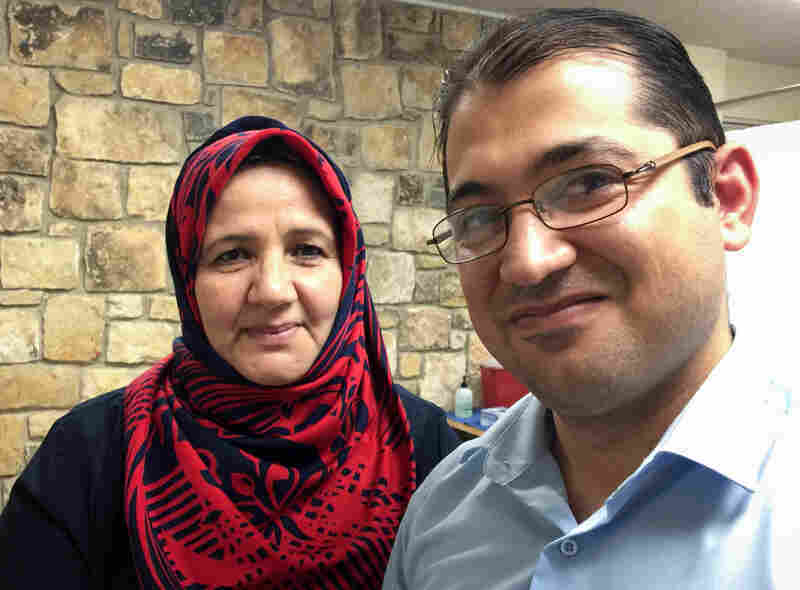 Each Wednesday at St. Francis Episcopal Church on the north side of San Antonio, dozens of refugees from all over the world come for free care at the Refugee Health Clinic. Students and faculty at the University of Texas Health Science Center in San Antonio have teamed up to operate one of the only student-run refugee clinics in the country. Layla Mohsin, a teacher from Iraq, and her son Karrar Al Gburi are clients of the Refugee Health Clinic. In the past six years, more refugees have resettled in Texas than in any other state. That was before the state of Texas pulled out of the refugee resettlement program in September, citing concerns over terrorism. The refugees who come seeking care are from the Middle East, southern Africa and Asia. They have fled violence and persecution. An estimated 5,000 refugees live within 3 miles of San Antonio's medical center. Most who have resettled here receive temporary federal government health benefits that run out after six months or so. "We really fill that gap before they can kind of get on their feet after they've lost their government benefits," says Michael Tcheyan, a medical student who volunteers at the clinic. "We feel like it's our duty, and it's their right to get medical care and to be connected with services that are going to make their life better." Medical students from the Student Faculty Collaborative Practice of UT Health San Antonio help provide care along with students from the School of Nursing, the School of Dentistry and the School of Allied Health Professions, which includes physician assistants, physical therapy and respiratory care. Layla Mohsin, 52, came to the clinic for dental care. She's a teacher from Iraq who came to the U.S. with her family of seven to escape the violence. "We left Iraq and came to the United States because there is safety here. There, there is no safety," Mohsin says as her son, Karrar Al Gburi, interprets for her. "The main concern? The lethal explosive cars. You can get caught by an explosive car at any place, any time." 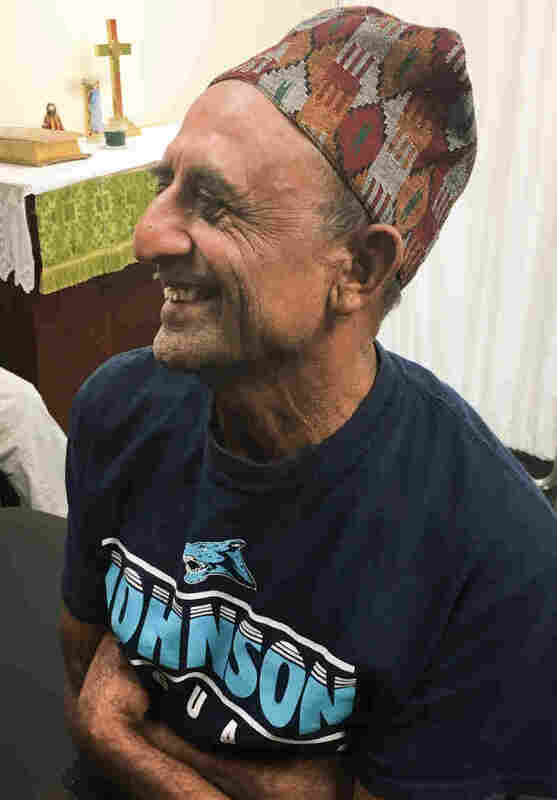 Laxmi Adhikari, 65, arrived in San Antonio from a refugee camp in Nepal. He is originally from Bhutan. Laxmi Adhikari, a 65-year-old old man who fled Bhutan to a refugee camp in Nepal, is being treated for an itchy stubborn rash. He sports a T-shirt with a local high school team logo, a gift from one of the many people in San Antonio who he says have welcomed him. "It's far better than the refugee camp," Adhikari says through Nepalese interpreter Dal Gajmer. "I trust and believe all of the nurses and doctors. They treat me very well." Dental student Eduardo Vela is originally from another country, too. He understands his patients' challenges. "If you don't know the language, there are a lot of cultural differences. I myself grew up in Mexico, so I know a little bit of the feeling of being an outsider and then trying to fit in," Vela says. The refugee population has many unmet medical needs, says clinic medical director Browning Wayman. "They are in search of people to manage their high blood pressure, their diabetes, their high cholesterol, thyroid disease, mental health issues," Wayman explains. "For a lot of us that went into medicine, we went into it to help people. This is a population that needs help, and so it's really a joy." 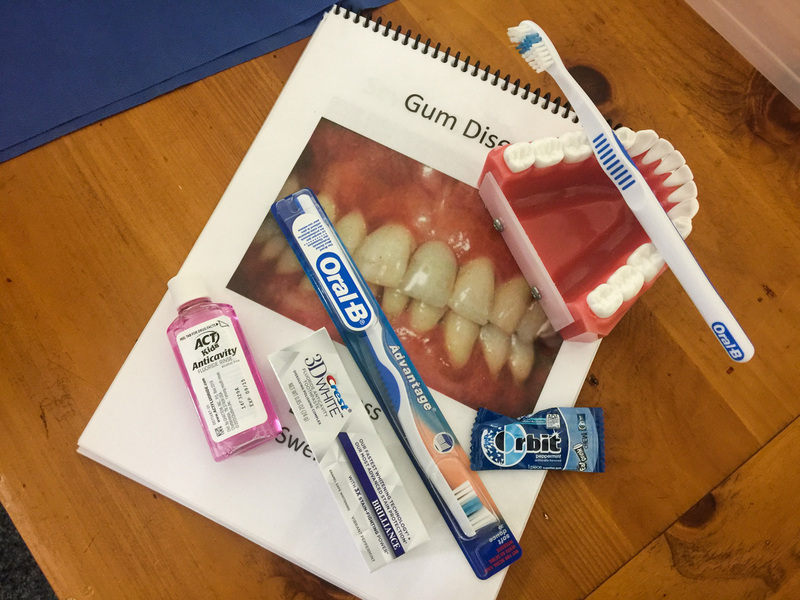 The Refugee Health Clinic provides necessities like oral care items to patients who often arrive in the U.S. with nothing. Funding for the Refugee Health Clinic is provided through the Kronkosky Charitable Foundation and St. Luke's Lutheran Health Ministries Inc., as well as the operations budget of the Center for Medical Humanities and Ethics, part of the School of Medicine of the University of Texas Health Science Center at San Antonio. Endowment funds, individual donors and the university pitch in to cover other costs. Texas will continue to be home to new refugees. But instead of giving financial assistance to the state, the federal Office of Refugee Resettlement will be giving that money directly to nonprofits. The refugees don't use the free clinic forever. The staff helps them find more permanent care. If patients need a referral to a specialist, they may have to find a way to pay for that visit. The students and faculty also work to connect patients to whatever health coverage they might be eligible for, such as CareLink, a financial assistance program for health care services through University Health System. It's available for Bexar County residents who do not have public or private health insurance. The cost is based on family size and income. Navigating the health care system can be difficult even for Americans, says one of the clinic's founders, Dr. Andrew Muck, an associate professor of emergency medicine at UT Health Science Center, so he says it is hard to imagine the difficulty for these refugees. "You don't speak the language, may not have a job," Muck says. "And even though you're in the midst of this robust health system, you can't get in the door, can't get over those hurdles."